The top tech and healthcare PR firm — MACIAS PR — has released its quarterly media report, detailing the coverage it secured for its clients from July to September 2017. Both TV segments educated viewers on a mobile app that tells consumers the cheapest price to buy any prescription drug, regardless of neighborhood. WABC-TV is ranked number one at 5 p.m. to 6 p.m., when the segment ran. In July, MACIAS PR secured another TV segment for that same client on the Channel 11 Morning Show. The morning segment explored how prices for the same prescription drug can vary by hundreds of dollars in the same neighborhood. In the B2B space, MACIAS PR secured stories during the third quarter for its clients in the American Journal of Managed Care, Med City News, Markets Insider, Med Gadget, Mobihealthnews and others. In September 2017, the 2017 ACQ5 Global Award named MACIAS PR the PR Firm of the Year. The global award is given by marketing and industry PR peers. The ACQ GLOBAL AWARDS has honored business leaders and innovators across different industries since 2006. Also, in the third quarter of 2017, the aggregate source for tech news, TechNewswires, added MACIAS PR to their list of best PR firms in the health and tech sectors. TechNewswires released the names of the best PR firms by industry in their newly released PR App. As part of the selection, TechNewswires reviewed PR firms across the country, focusing much of their research on firms located in New York, San Francisco, Los Angeles, Chicago and Miami. The developer of the PR APP, Alexa Eskenazi, said TechNewswires did not receive any compensation from the PR firms named in their free app, which can be downloaded on iOS or Google Play. She said their PR recommendations were based on interactions with PR firms from across the country. 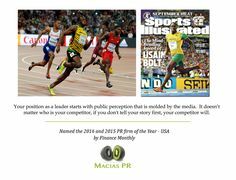 MACIAS PR was founded in 2009 by Mark Macias — a former Executive Producer with NBC, Senior Producer with CBS in New York and author of the business book, Beat the Press: Your Guide to Managing the Media. He’s currently a contributor for CNBC and The Daily Caller, giving PR, media analysis and crisis advice on timely business and political stories. MACIAS PR offers a wide range of services, including publicity, media outreach, introduction to journalists, messaging, social media, video production, crisis communications and original content for blogs/newsletters. MACIAS PR has run media and branding campaigns for clients in healthcare, digital health, financial services, technology and the nonprofit sector.